This week should have brought long-overdue updates to rules preventing methane waste and limiting wasteful flaring of natural gas on public and tribal lands should have gone into effect. Despite the real need, a methane waste prevention rule did not go into effect. Instead of providing vital protections for families in communities like mine, the administration suspended these regulations despite finding strong support for the rule in Congress and among the American people. Unfortunately, the rule’s suspension comes at the expense of taxpayers, public health, and the environment — including all who live on the Fort Berthold Indian Reservation in Mandaree, North Dakota. The Bureau of Land Management’s (BLM) Waste Prevention Rule would have required companies drilling on public and tribal lands to reduce the leaking, venting or flaring of natural gas through maintenance of equipment and use of proven technologies. This is a rule that my community fought for because we experience the impacts of methane pollution daily.The Fort Berthold Indian Reservation is surrounded by nearly 1,000 oil and gas wells that make the unceasing extraction of the resources beneath our land hard to escape. The air smells like rotten eggs, the noise disrupts our lives and the gas flares make our night skies look like bright summer days. But even with all the evidence of pollution, I did not fully understand the severity of the problem until I stood next to a gas well with an infrared camera in 2016. Giant plumes of methane leak into the atmosphere like an invisible oil spill, unseen by the naked eye. As an environmental student, climate activist and a Mandaree resident, witnessing the extent of the methane leakage across my community left me speechless. This is why I joined a lawsuit to stop the Trump administration from willfully polluting our community and wasting our resources. The lawsuit challenged the authority of the administration to suspend the methane waste rule without adequate public process and in defiance of its legal obligation to take all reasonable precautions to prevent waste of publicly owned oil and gas. Studies have shown that flaring, venting and leaking of methane and natural gas causes increased risks of asthma, respiratory infections, cancer and neurological damage. We have experienced several of these impacts firsthand as oil and gas activity has increased exponentially over the last decade on the Fort Berthold Indian Reservation. Though we are told that we live a safe distance from the drilling, our family’s medical tests mirror those of the drillers themselves. They get paid to take that health risk. We don’t. I also worry about the impact of methane pollution on the planet. Methane, a greenhouse gas that is 86 times more potent than carbon dioxide, is the second-largest contributor to human-caused climate change. The suspension of the rule hurts our pocketbooks, too. Between 2009 and 2014, oil and gas companies on public and tribal lands vented, flared and leaked about 375 billion feet of natural gas — enough to supply over 5 million homes for a year. According to BLM’s own calculations, suspending the Waste Prevention Rule will increase methane emissions by 175,000 tons over the next year and result in the waste of 9 billion cubic feet of natural gas. The Government Accountability Office found in 2010 that 40 percent of the natural gas vented and flared on federal lands could be captured cheaply with technology that was cost-effective and readily available. Without the Waste Prevention Rule, companies pay fewer royalties on the gas they waste which means taxpayers lose out on millions of dollars in revenue every year — including funding for schools and infrastructure projects. We need common sense controls on methane pollution. We need monitoring, testing and studies that explain the environmental and human health impacts of exposure to methane and other pollutants released alongside methane during development. The 2016 Waste Prevention Rule promised all that — but today our communities are being denied those vital protections. The Waste Prevention rule did not go into effect this week as it should have. While we might not be able to see the methane pouring out of wells without an infrared camera, as long as the methane waste rule remains suspended, oil and gas companies will continue wasting millions of dollars worth of our shared natural gas resources at the expense of taxpayers, public health, and the environment. 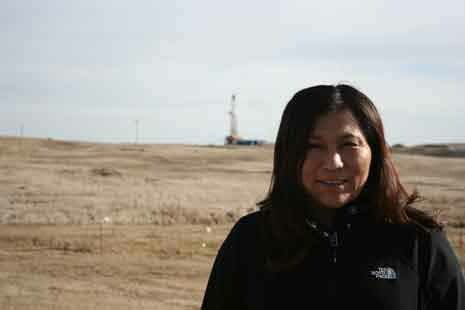 Lisa DeVille is the president of the Fort Berthold Protectors of Water and Earth Rights (POWER) and a board member of Dakota Resource Council and WORC. Her commentary was published in The Hill.